Successfully Added Exercise Watch - Pulse + Calorie Reader to your Shopping Cart. Exercise Watch - Pulse + Calorie Reader. Wholesale priced Digital Wrist Watch which will let you read your pulse rate and see how many calories you have burned. 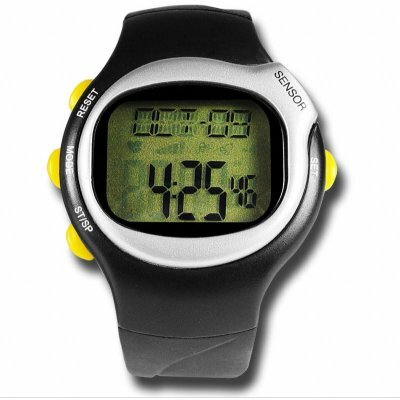 This innocuous looking Digital Watch is a great choice for exercise enthusiasts looking for exact readings, or people looking to loose weight and needing a little help to make sure they are not doing too much too fast. Added to the pulse rate and calorie reader, you will also be getting a time and date display, a stopwatch with split lap time, and even a option for entering personal information to best take readings. This is a great gadget watch to own for your own personal fitness program, and is available for a much lower price than you would ever expect from such a multi-use device. Get one today to enjoy for yourself. on 2009-12-23 11:04:35 works like a charm! this is a great tool to help with my exercise routine. thanks chinavasion! Great price for such watch. They helped me many times. I've bought them with underwater mp3 player and now my satisfaction is on maximum. Sport is my life. And with this gadgets sport is much more pleasant. Now everyone can train safely with this product while monitoring his pulse rate. Has helped me so much with my gym work. It's so cheap I can afford to give one to each of my customers as an incentive.